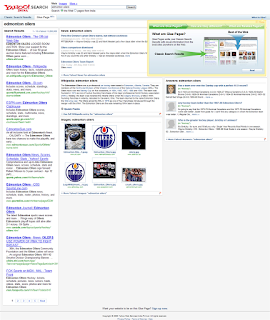 Yahoo Glue Pages: Yahoo to Copy ASK's SERP Layout? I used to be a big fan of ASK.com. That is until a few weeks back when they decided that they were no longer going to compete as a true search engine and were going to attempt to focus on their main target demographic of middle aged women. The breakdown of Glue Pages from Yahoo is as follows. Glue Pages unite your Classic Search Results with visual information from the best sites anywhere on the Web. For now, Glue Pages include images, videos, articles, and more all on one page! The goal of Glue Pages is to help you spend more time learning and less time searching. There are "Related Pages" which are Glue Pages that Yahoo thinks you might be interested in based on the topic of your search. Based on user intent, Yahoo is trying to provide you with a richer experience. I think that it is pretty cool. I hope that they launch this with their main Yahoo search product. It will be great to take such as rich Search Results Page to the masses something that ASK failed to do. Try it yourself. I performed a number of different searches in hopes of receiving the "Glue Page" results. I searched for Google, Van Halen, Kiss, Mexican food, Toyota, Las Vegas, Iron Man and pizza just to see how the results varied with these new blended search results from Yahoo. I love the results. While relevancy will always need to be improved, the experience on a results page such as these Glue Pages is so much better than on a Google SERP and especially on a Microsoft/MSN/Windows Live Search SERP. I'm interested in having my website published on a Yahoo! India Search Glue Page. Please contact me with more information. For online marketers, it illustrates the need to optimize for blended search even more. You can expect Google to continue to increase their blended search efforts, ASK is already doing it and now Yahoo will be adding more blended search results through products such as the Yahoo Glue Pages. Glue is sticky and that is exactly what Yahoo is shooting for. they want you and I to spend more time using their search. Improving the SERP is a great start.